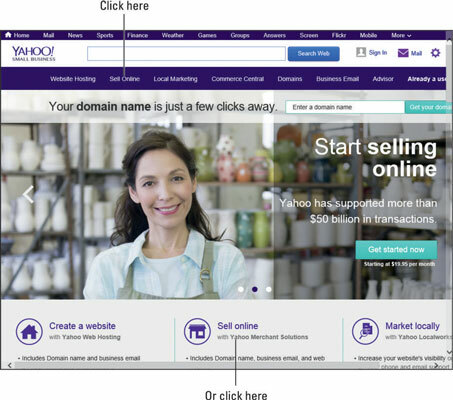 How to Set Up Shop on Yahoo! 1Go to the Yahoo! Small Business home page, and click Sell Online. 2Click the Sign Up button under the plan header that you want. Yahoo! Small Business offers more packages than just its Merchant Solutions. 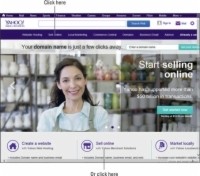 If you want to build a regular website, buy a domain name, or sign up for online marketing services, you can do so at Yahoo! Small Business. 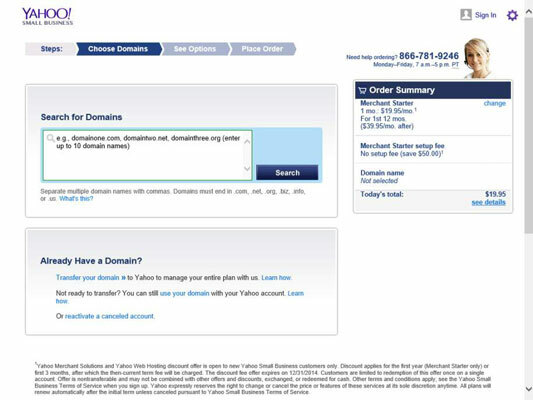 3Enter a domain name for your Yahoo! store. If your first choice is taken, Yahoo! offers you suggestions of available domain names similar to your request. When you find an available domain, Yahoo! will prompt you with options for your order, such as private domain registration. If you already have a domain name, simply click the appropriate link under Already Have a Domain? section. 4Log in to Yahoo! with your Yahoo! ID. If you’re new to Yahoo! or want to create a separate ID for your business, create a Yahoo! ID by clicking the Sign Up link. You see the Yahoo! 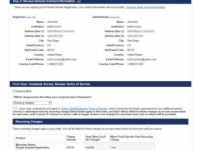 one-page sign-up form. Enter your personal identification, such as name, birthday, e-mail address, gender, and phone number. Choose a user ID and password. 5In the Choose Payment Method section, enter your billing information. You have to enter a credit card number to leave on file for Yahoo! to bill you monthly for your Merchant Solutions package. If you’re new to Yahoo!, you need to verify your billing address for the card. 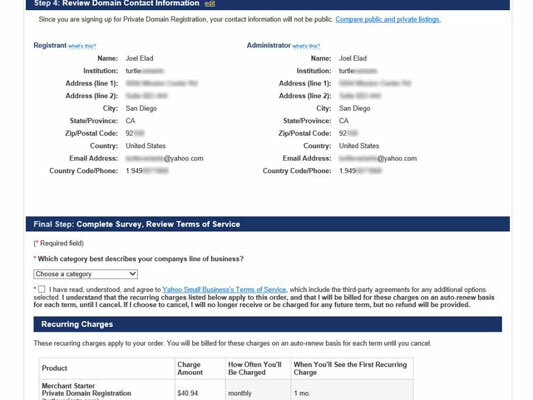 6Review your options, agree to the terms of service, and select a category from the drop-down list. 7To finalize your order, scroll down to click the Place Order button. You need to select the check box to agree to Yahoo!’s terms of service and select your category.